The Easter Bunny, of course, is famous for delivering chocolate eggs – and we all like to indulge a little over the Bank Holiday weekend (or should that be over-indulge?!). 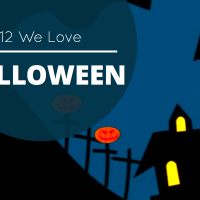 But the celebration doesn’t have to be all about chocolate. 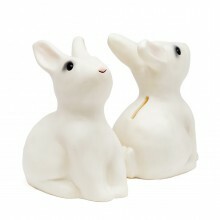 Just look at our sumptuous selection of goodies that features bunnies and showcase Spring. No need for a chocolate sugar rush: this bounty is quite sweet enough! 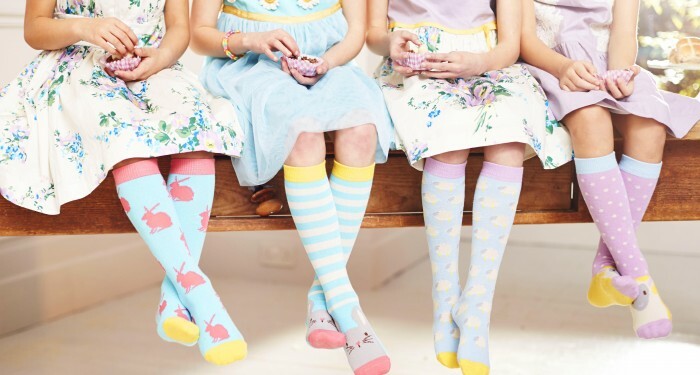 Mini Boden Novelty Socks Step out in Spring style with a pair of novelty socks to pep up your feet. These fun sets (with two pairs each) come in Topaz Bunny or Honey Lamb design. Sizes from 6-12, 1 to 5, from £10 by Mini Boden. Fifi Lapin T-Shirt Fashion favourite Fifi Lapin created a limited edition capsule collection, including this long-sleeve T in super-soft cotton. 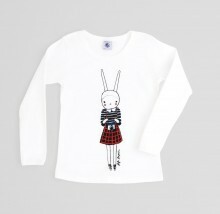 Ages 3-10 years, £18 by Petit Bateau. 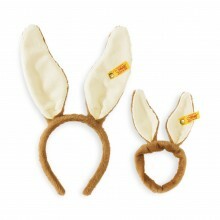 Steiff Bunny Ears Prick up your ears and listen up: these are officially Easter’s cutest fashion accessory and great for dress-up any time of the year. Made by master soft toy maker Steiff, it includes a headband and a matching bunny ears scrunchie for fancy up-dos – or hare-dos! One size, £13.77 from Smallable. 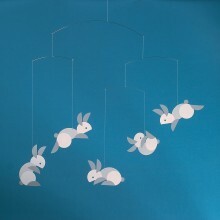 Flensted Rabbit Mobile A cute coterie of bouncing bunnies makes a whimsical mobile by Flensted that hangs on an almost invisible thread. 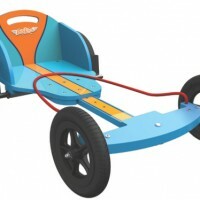 £16.20 from Smallable. 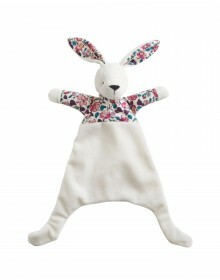 Joules Porcelain Comforter Harriet the hare is made from super soft velour so she’s made for hugs and cuddles. And as for those ears: they’re made for stroking! £12.95 by Joules. Mini Boden Applique Play Set This pure cotton poplin suit features an adorable applique bunny and soft floral blooms, in sweet shades of grey and pastels. From birth-3 years, from £26 by Mini Boden. 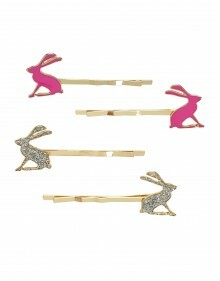 Joules Hare hair clips Add sparkle to your chignon and pizzazz to your ponytail with these glittery hair grips, £6.95 for four by Joules. Money Box A pot to stash your pennies safely, £16 by Hedgehog. 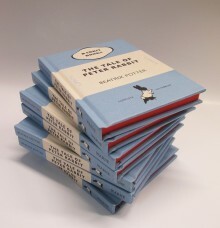 The Tale of Peter Rabbit Revisit the adventures of the famous little rabbit in the blue jacket in this smart Penguin Classic Edition, £9.99. 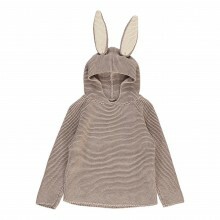 Rabbit Pullover Chic and understated, this playful pullover has bunny ears! From 6 months-6 years, £51.30 by Oeuf NYC at Smallable. 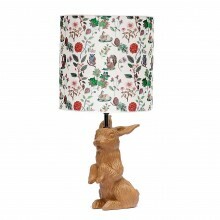 Jeannot Rabbit Lamp Designed by artist Nathalie Lete, this pert bunny stands to attention at all times. £120.70 at Smallable. 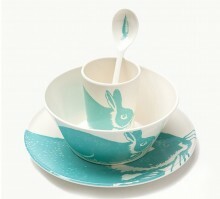 Rabbit Dishes Serve up breakfast with these melamine dishes designed by Thomas Paul for Atomic Soda. Available in blue or pink. £23.50 at Smallable. Still want more? Hop over to our 12 We Love… Bunnies feature for even more fluffy fabulousness.